Global Voices Summit 2012 | A meeting of bloggers, activists and technologists for public discussions and workshops about the rise of online citizen media movements worldwide. The Global Voices Summit convenes bloggers, activists and technologists for public discussions and workshops about the rise of online citizen media movements worldwide. 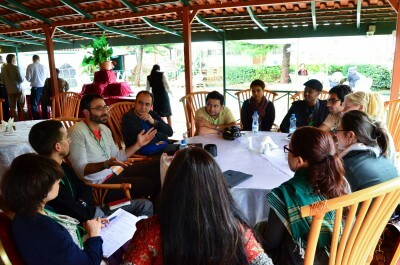 There will also be a private gathering of Global Voices contributors preceding the Summit. We hope to see you in Nairobi! Thank you to everyone who joined us in Nairobi, it was a spectacular pleasure to meet with you! The Summit's not really over until you have shared your reflections in your own blog! Help us update this list of Media and Blog Coverage. In this edition of the Global Voices Podcast you'll hear more from our Summit which took place in Nairobi, Kenya, back in July, including some of our contributors and selected academics from around the world were also invited to share their knowledge and learn from the community. At the recent Global Voices Summit held in Nairobi, Kenya in early July 2012, Rising Voices held a competition to provide travel scholarships to five microgrant applicants from Kenya and Uganda, who were unable to fund. This was an excellent opportunity to further engage these members of our community. Meet them and learn about their work. Gilad Lotan of SocialFlow introduces us to the recently popular world of data visualization and asks if it is actually advancing the stories we are telling? Panelists Tarek Amr (Global Voices, Egypt), Kepha Ngito (Map Kibera), Nathan Matias (MIT Media Lab) and Marek Tuszynski (Tactical Technology Collective) explore some answers. Participatory health media has been enabling citizens to tell their personal stories about the impact that health issues have had on their lives, but it can also play an important role in collecting and distributing vital information needed in developing countries. Giants of the Internet: What Roles and Responsibilities? A famous proverb says, “When elephants fight, the grass suffer. When elephants agree, the grass gets eaten.” With that introduction, our moderator Ivan Sigal, notes that corporations run a large portion of our digital publics.